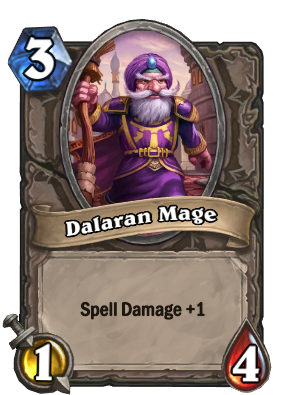 This poor guy will still get sh*ted on next two years by Spellshifter unless some odd spellpower deck except mage gets populer . i think that he should be a 2/4 like most 3-mana minions, f*ck me, right? Harder to kill than spewer, bloodmage or kobold, 1 damage might also help it be ignored. Also works with Hobgoblin if you like that thing. Even so, this would be a one of in a deck at most. Now that Soot Spewer is around, this card is unbelievably underpowered. I know Soot Spewer would be expected to be a little better, because it's a class card, but honestly, Soot Spewer has more stats, a better balance of stats, AND mech synergy. This card needs some sort of buff so it isn't ridiculously worse by comparison. Used to be a 2/4. Why did they ever nerf him? not op anymore if they would reverse it. There would still be better options.